I first saw this picture on a recent episode of either George Lopez or Jimmy Kimmel, I don’t remember which. But I do remember the sick need to post it as a caption contest and see what we could come up with. Aparicio family, please forgive me. 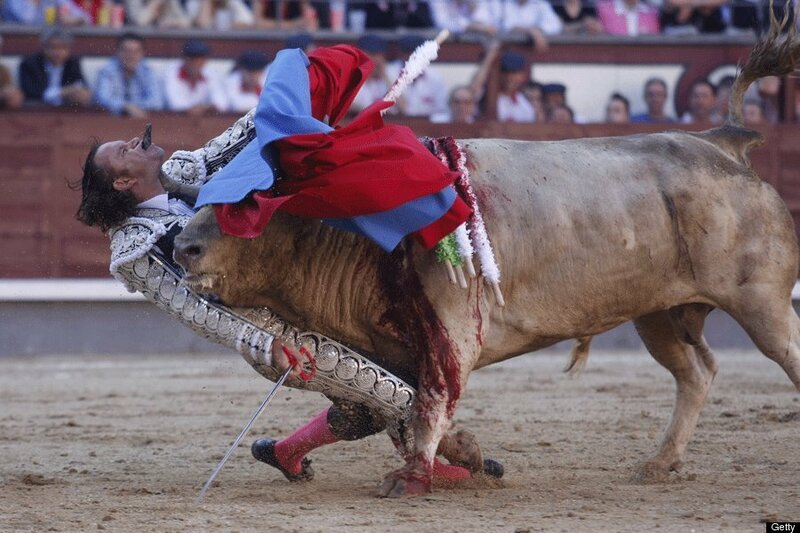 As we all know, bullfighting is as dangerous a sport as they come. Sure, most professional football players end their careers with countless concussions and knees they can barely walk on, but rarely are they gored in the mandible by an angry, two-thousand pound animal. In this week’s caption contest, we find one of Spain’s most famous matadors, Julio Aparacio, sent into early retirement by a bull named Opiparo. Please do NOT try this at your local country bar. Aparicio has since been released from the hospital which means it’s now safe to make fun of him for his chosen profession. Have at it, chumpeteers. The winner of this week’s caption contest will receive a free can of Red Bull and a hamburger. This entry was posted in Pigskin, Screen and tagged Bullfighting, Caption Contest, Final Four, George Lopez, Jimmy Kimmel, Julio Aparicio, NFL, Red Bull, Spain, World Cup by Chris Humpherys. Bookmark the permalink. Oh Damn, This is gonna leave a mark!! M…. Sorry. I know you didn’t like this pic but I just had to put it up. Is it my imagination or does Aparicio look a little like John C. Reilly? Kay going all Chris Farley on us. We’re off to a nice start. And Frank… don’t you think that’s the least Spain could do to get LeBron. I can’t wait to hear the Knicks’ counter-offer. I think I pulled out the victory cigar a little too early! Senor I’ve come for your balls ! Who’s On First Who’s On Second As A Matter Of Fact Does Anyone Care Who Finishes Second Much Less Who Gets Knocked Out of A Competition ? Chris Simms gets pulled over under the suspicion of DUI . His bac comes back .000 but he admits to the cop that he’d been smoking weed so the cop cites him for that violation . JaMarcus Russell gets busted for having a controlled substance i this case codeine without a prescription as the amount he has in possession apparently violates federal law. Ain’t life grand in the NFL ? What part of “No Fumar” don’t you understand Don Aparicio? ‘Mess with a bull, get the horns’ is a memo Sr. Aparicio apparently never got. Oh what, oh what, has become of the SportsChump hour? Duhon signs with the Magic ….. four yrs $16 million. So where does that now leave Nelson and White Chocolate ? Bosh says he doesn’t want to play with LeBron in Cleveland but is willing to play alongside him in either Miami or Chicago. My initial thought when I heard that news and that dollar figure was DAMN!!! that’s a lot to pay for a back-up point guard. I can only assume that White Chocolate is gone, maybe some of that having to do with his post-season locker room tirade. I’m also guessing that the Chris Paul rumors were never founded and that the Magic don’t have any money left for anyone to bolster that PF spot. And last time I checked, Al, Bosh isn’t calling the shots. This is still LeBron’s show. Bosh can ride along if he wants or go to the Clippers. By the way, the palm tree outside my house looks like Chris Bosh before he cut his hair. It looks like Opiparo had plans for Aparicio’s mouth other than just a stogie, huh? John C Writhing. Very nice, although I will take an assist on that one. I, Julio Aparacio the toughest bullfighter in all of Spain will not only fight this bull, but I will also eat him starting at the horns. Then Julio invented a new way of eating steak, Aer… through his chin. Julio Aparicio…. the other white meat! Not bad, perla. Not bad. Frank, not bad. That’s not exactly the kind of Red Bull I like my vodka with. Liz, also not bad. But it looks like poor Julio got a little bit too much bone with his meat. The latest Spanish Cuisine – Aparicio Kebab. Looks a little like a unicorn in this photo, no? Not sure where you came from or how you found the link but you are more than welcome to come back and participate in future caption contests. We’re always looking for sick minds like ourselves. Stumbled in, and will stay, thank you very much. Yes, very sick sense of humor. And I like hamburgers. Apparently, Ellen, hamburgers are also quite fond of Mr. Aparicio. What gores around comes around! he really took the horn by the bull. Hahahahaha serves him right. Bullfighting is a cruel and primitive sport that should be outlawed.﻿ Animals do not deserve to be killed for sadistic pleasure. I sincerely hope and pray (at the bottom of my heart) that el matador lives a long, painful and agonizing life. May he develop cancer of the throat. Remember kids, Dental Floss is for wimps! Call me a wimp but I think I’d prefer the dental floss treatment. And you thought having “two left feet” was a problem. So this is what it takes to stop Spaniards from lisping. I know I’m late to the party, but I couldn’t resist.